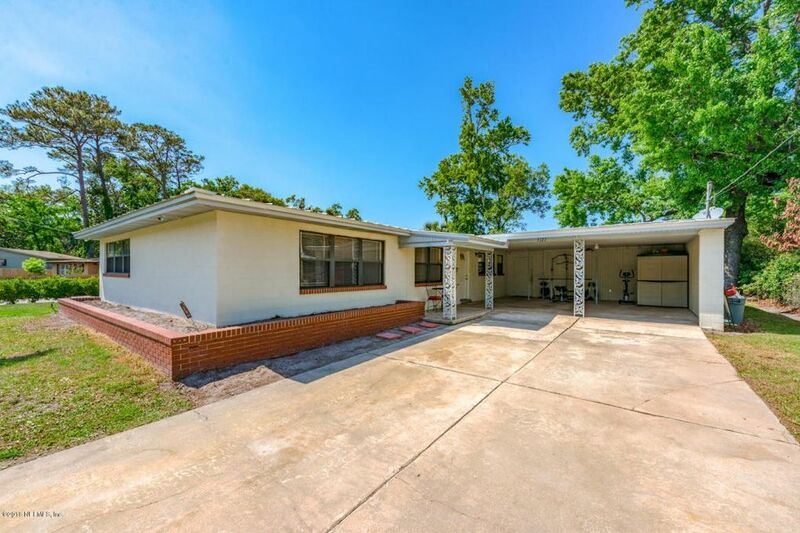 MULTIPLE OFFERS - F&B DUE IN WRITING BY 5PM SUN 5/13/18 Great starter home built with concrete block situated on spacious fenced lot with large detached out building. Lots of laminate wood flooring & wall to wall carpet throughout; kitchen has food prep bar which makes a great workspace. Master bedroom has en suite bathroom w/updated walk-in shower & vanity. The secondary bedrooms are good sized and hall bathroom is also updated. Backyard is loaded with several different type of fruit bearing trees. Metal roof is only 5 yrs old, HVAC installed in 2008, electrical panel updated in 1995, windows replaced in 1990s, washer & dryer located in laundry room off glassed enclosure in back of home, seller will leave for new owner, there is also a utility sink. Directions: West on Beach Blvd from University Blvd S then t/l on Spring Glen Rd, t/r on South Pines Dr, house will be on the right.